I7081 1915 - 1916 (1 years) Submit Photo / Document Has 17 ancestors but no descendants in this family tree. 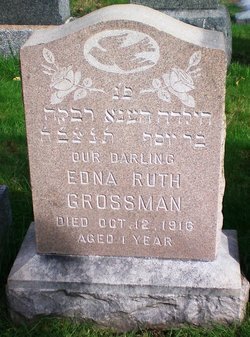 Precious Little Angel Edna Ruth was the first child of five children born to Esther B. Loitman, and Joseph Benjamin Grossman. Edna Ruth passed away before her siblings were born. William Sidney Grossman (1926?1933), and Pearl Hia Grossman (1930? ).